ORLANDO, Florida – Providing even more comprehensive and cost-effective audio solutions for environments such as restaurants, retail stores, conference rooms and smaller houses of worship, HARMAN’s JBL Commercial is expanding its lineup with the introduction of its CSMA mixer/amplifiers, five models that incorporate Crown’s exclusive DriveCore™ amplifier technology for improved performance, lower cost, reduced size and weight and efficient operation. “Our JBL Commercial mixer/amps are designed for places where a simple, high-quality audio solution is needed and an elaborate A/V installation isn’t required,” said Craig Lambrecht, Business Segment Manager, Amplifier Business Unit, Crown Audio. All CSMA models incorporate Crown’s proprietary DriveCore amplifier IC chip. The DriveCore chip combines the amplifier driver stage into the power output stage along with additional audio-signal functions, yet is about the size of a postage stamp. DriveCore enables significantly reduced size and weight – all mixer/amps are just 1U rack space high and most models are only a half-rack wide. All models can drive 8 ohm and 4 ohm loads and can be used with 70V and 100V distributed audio systems without the need for a separate transformer. All feature a universal power supply which enables the ability to accept AC voltages from 100 to 240 VAC, 50/60Hz. 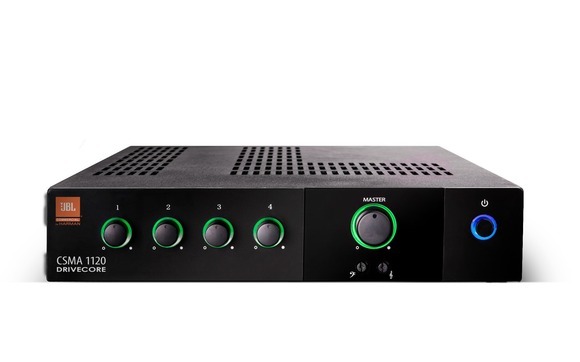 The CSMA mixer/amps offer unmatched ease of use, with a clean, front panel featuring only volume controls for each channel, master volume adjustment, adjustable bass and treble controls and a power switch. All the volume controls are surrounded by an illuminated ring, making them easy to see and operate in darkened environments. In addition to balanced mic/line inputs, unbalanced RCA inputs and speaker connections, all units include RJ45 connectors for use with JBL CSR-V in-wall volume controls. JBL Commercial mixer/amps are manufactured under HARMAN’s GreenEdge™ environmental initiative, conforming to lead-free RoHS standards and utilizing recycled copper, aluminum and steel, an energy-saving powder coat finishing process and other environmentally-conscious manufacturing processes. The DriveCore design reduces power consumption and powers some of the most efficient amplifiers in the install market. All models carry a 3-year no-fault transferable warranty.